For a real-time look at building progress, check out our construction cam. 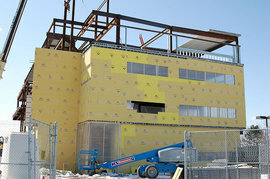 When the new School of Business building opens in the spring of 2008, it will be a model of sustainability in action for the business students and faculty who will call it home. At 38,800 square feet, this “green” building will save at least 50 percent more energy each year than a typical building of the same size. Two of its most prominent features will be a vegetative roof and a south-facing wall of glass designed to conduct solar energy and enhance the work environment with natural light. Classrooms and workspaces are also being built with networking and teamwork in mind. Several collaborative breakout rooms and an expanded Center for Trading and Analysis will provide opportunities for students and faculty to work closely both in and out of class. The College is seeking platinum-level LEED certification for the building—the highest level that a building can receive from the U.S. Green Building Council’s Leadership in Energy and Environmental Design.